Today I’m tackling the beloved (and often dreaded) stridex pads a.k.a. stridex in the red box. This is yet another product I avoided for a very long because of the negative testimonials I read online (e.g. Paula’s Choice). However, when I finally took the plunge and used it I was pleasantly surprised. Let’s talk what I do and don’t like about Stridex, and why I think every skincare addict should have a tub of this in their arsenal. 2 Why I like Stridex. 3 Tips for Using Stridex on Sensitive Skin. 4 How to Use Stridex Pads. Inactive Ingredients: *Ammonium lauryl sulfate, ammonium xylenesulfonate, citric acid, DMDM hydantoin, *fragrance, *menthol, PPG-5-Ceteth-20, purified water, simethicone, sodium borate, tetrasodium EDTA. Right off the bat we can see why these acne pads are initially met with disdain. A surfactant often derived from coconut. It acts mostly as a detergent or cleansing agent. Surfactants aren’t the greatest ingredients to leave on skin because they can be drying. Joking aside, fragrance is another ingredient that could be irritating to the skin. Especially for those that have eczema or compromised epidermal barriers. Read more about fragrance in skincare here. 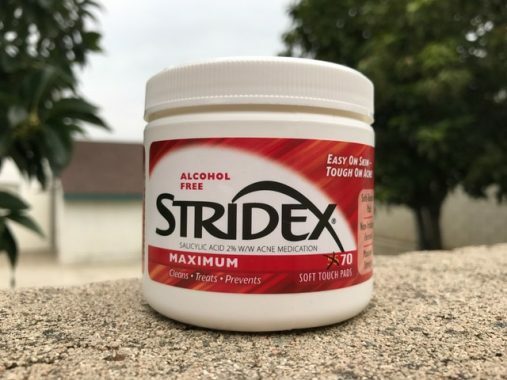 What gives Stridex the “cooling” sensation. Menthol is derived from peppermint, is an analgesic (i.e. painkiller), and used as an antibacterial in dental care. However, this is yet ANOTHER ingredient that isn’t great for skin. A beta hydroxy acid (BHA) and chemical exfoliant. Salicylic acid is oil-soluble meaning it gets inside the crooks and crannies of pores to break up the debris and gunk that causes pimples. With that said, let’s talk about why I (a very sensitive-acne prone individual) am a fan of Stridex. Hopefully I can convince you that these pads are your friend not foe! Easy: it works. And it works incredibly well. 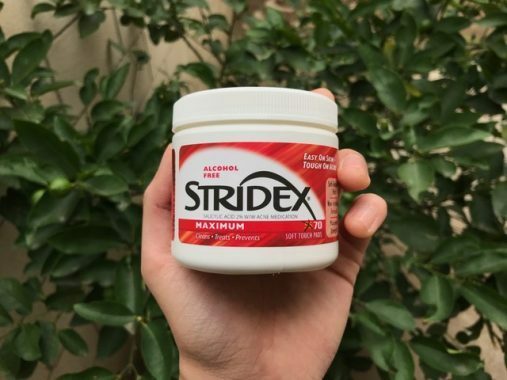 If your other BHAs aren’t cutting it, consider using Stridex. It’s something I think everybody should have on hand in case they need go nuclear. As you may know, salicylic acid requires a pH of 4.0 to work its magic. Anything above this sweet spot and it becomes less effective. If you want to learn more about pH go here. For whatever reason, I’ve had problems in the past with popular BHAs like Paula’s Choice being more alkaline than advertised (i.e. pH > 4). Recently, a similar controversy arose with COSRX. Stridex however, never disappoints in this regard! I’ve yet to hear of a single person complain that Stridex doesn’t have the right pH. Just writing that sentence made me giggle, cause trust me…. you’ll know this stuff works because it doesn’t tingle, it straight TANGLES. There is a reason Stridex is often recommended on r/skincareaddiction. It has a proven tract record spanning over 50 years. That alone is a testament to its efficacy and reliability. For sh*ts and giggles, here’s a cheesy a commercial from the 70s. Few skincare products have stuck around for this long. Wanna know why? Because many don’t stand the test of time — they get weeded out throughout the years for being ineffective. If something stays on the market it’s either for two reason: it works, or there’s demand for it (sometimes both). Tips for Using Stridex on Sensitive Skin. Like we discussed in the ingredient section, it’s no secret that Stridex can irritate the skin. This will be particularly true if you er on the sensitive side of skin types like myself. However, you can reduce the irritation of Stridex by doing one simple trick — rinsing if off after 20-30 minutes. It takes about 30 minutes for your skin’s pH to neutralize salicylic acid. After that point, it is technically done exfoliating. Note: leaving it on for longer does provide additional anti-inflammatory benefits. Rinsing off Stridex after 30 minutes means you won’t have to leave on the irritating surfactants and menthol overnight/during the day. Just a little trick to consider utilizing if you decide to give the good ole’ Stridex a shot. UPDATE: I spoke too soon, and my skin got irritated. Sigh, why I must I be so impulsive? I ended up only using it twice a week without rinsing it off, and this seemed to work very well for me. And for the heck of it, here’s another little tip: after you’re done shaving, wipe down the area with a Stridex pad. It’s a great way to reduce ingrown hairs. How to Use Stridex Pads. Because this is a pH dependent product, the order of it in your skincare routine matters. Here’s a cheat sheet to help you out. Adjust this accordingly depending on what skincare products you’re using. Oil Cleanse (OCM) or Oil Cleanser. Low pH serums like ascorbic acid (vitamin C). Wait 20-30 minutes. Use Stridex Pads here! Simply wipe your face with them and wait 20-30 minutes. AHAs like glycolic or lactic acid. Wait 20-30 minutes. Other acne treatments like azelaic acid or benzoyl peroxide. Note: Asian Beauty routines can have additional steps not listed here. Alright, it ain’t the sexiest ingredient list because of the surfactants and menthol…. But remember you can reduce the irritation of these with the tips I gave above! Very effective acne treatment, refines pores, and prevents blackheads. Convenient pads that you simply wipe across skin. They leave no residue. Comes in an awesome tub with a twisty cap. Why Vitamin C Serum has to be before the Stridex? Can it be applied after Stridex? I like stridex a lot better than clearasil or oxy (which the ones that I have seen also use Salicylic Acid) because I find them a lot less drying because it doesn’t have alcohol in it. Thanks for this review. 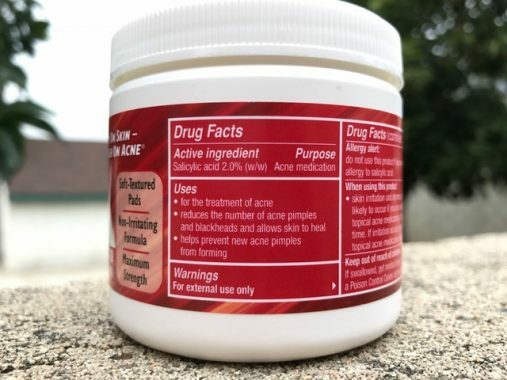 I’ve had some very deep, painful, and long-lasting cystic breakouts after using Paula’s choice BHA and other drying anti-acne routines that required oral antibiotics and multiple injections to bring down the painful infection and swelling. I wonder if my skin is just too sensitive to being dried out and that this is what triggers my cystic breakouts, which are genuinely nightmarish despite my otherwise pretty good skin. I’ve been incorportating your idea of washing off benzoyl peroxide in the morning, and it seems to be helping, though it seems that I can still only tolerate this every few days before I start to get too dried out again. Do you think that same idea would work here with Stridex maybe once a week in the morning and washing it off before cleansing and applying moisturizer? I’ve always read that salicylic acid is helpful, but I want to stop overstressing my skin because that might be a big trigger for me, especially since I use one pump of curology with .017 tret, 4% azelaic acid, and .25 pyrithione zinc at night (which I really like). Also, why do you think stridex is less drying that Paula’s choice BHA? Thank you for your blog. The sebamed clear face gel has been a game changer for me! I layer it under my am and pm moisturizers (Olay complete sensitive 15 for am, elta md pm for pm) and it seems to be helping! I’m interested to see how it will work in the winter with a heavier daytime moisturizer for sensitive skin. I really liked Paula’s choice skin recovery with SPF 30 last winter since it uses mineral sunscreen and my skin is less sensitive to it than moisturizers with “chemical” sunscreens. Thanks again for the work you do! I can relate to your writing, and that picture of your face being too stressed out by Paula’s choice BHA, a product so many people swear by, makes me wonder if our skin is on a similar wavelength. There is no way I could get hubby to follow a 5 step routine. I want the blackheads on his nose to reduce, they’re on their way to being dime-sized. What about simple face wash, like Cetaphil or Neutrogena or Bonnors Peppermint soap followed by stridex at night and just plain facewash in the morning, with mineral oil for dryness? I’m only going to get 1 shot at this, so I want to get it right. Hi, your blog has been tremendously helpful. I’m suffering from a type of malassezia, specifically seb derm, and I found your article that covers this is really useful. Since then, I’ve used Cerave ream, which got rid of the dryness and flakiness of my skin. However, some acne and pustules appear on my chin, upper cheeks, and the side of my eyebrows. I figured I needed to incorporate Stridex, as a treatment, to my routine. Question: Where should I use Stridex, after 2 rinsing my face with water? Or after I pat my face dry? Hope to hear your reply! Thank you! All the best. Doesn’t your skin neutralize the low ph serum after that time, therefore your skin ph going back to being higher than 4? And therefore stridex being less effective? Your reviews are hella helpful – thank you! Have you tried the sensitive stridex in the green box? What are your thoughts? Is it possible that these Stridex pads will disturb the skin microbiome? I know they work fast for clearing the P. acnes bacterium but I’m also worried they will destroy the good guys. After a negative experience with BP I’ve definitely been on the cautious side! Waaaaaaw thanks for the advice dear. As for me (from Kenya, Africa), I do use Stridex Maximum and I keep on rotating them. At times I go for SENSITIVE and other times I use ESSENTIAL. This product is awesome, wonderful! I can wipe my face with it before I apply my Makeup, or at times I just wipe my face with the pads and don’t wash until evening and my face remains glowing the whole day….GOOD PRODUCT I SAY!